Listening to: "The Way I Am," Ingrid Michaelson. Brooch: Sarahoon, vintage, bought at Finder's Keepers. How I've worn the shoes: here. Went out with my family today to O'Charley's to celebrate our brother getting a new job. Congrats, Billy. I hate doing indoor photos because there isn't really a good spot in our apartment that can serve as a good backdrop or has good lighting. But tomorrow should be sunny so hopefully more lake shots. About the outfit. The J. Crew braided rope belt was a thrift store find at Salvation Army yesterday. It was brand new with tags, originally $30, and I got it for $3 -- score! The leaf pin is something I picked up at Finder's Keepers when I first started my brooch collection a couple years ago. I couldn't find much information on the designer "Sarahoon," except some similar looking brooches online. I also love this dress. It's sheer, floral and its navy color keeps the print subtle. It's 100% polyester but it's thin enough to be breathable. I recently discovered a cat of impossible colour and after being astounded by the smart mix of colors in her personal style, I was impressed with her guide to shopping thrift and vintage stores. 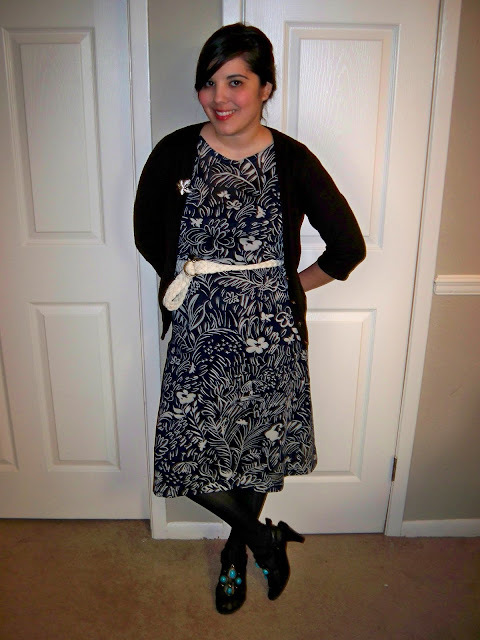 After reading through her posts, I was inspired to determine whether or not this dress would be considered vintage. It has a wash guide label and an old-looking brand label, so it's most likely from the 1970s or later. I googled the company and found that it was around in the 1950s-early 1990s, and from looking at some of their former dresses, I would date this dress at probably early 1980s. Do any of you do thrift shopping for your clothes, and if so, do you focus on a particular type of clothing (vintage, modern, by brand, etc.)? In other news, we're very honored and flattered to have received some blog awards this week, and I'd like to thank those bloggers now. 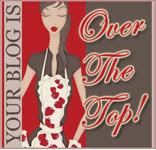 Athenista and UnVeiled both gave us the "Over the Top" award and Caffeinerd gave us the "Best Blog Award" -- thank you so much! These blogs are all daily reads for me and it's really cool to be acknowledged by women whose effortless, chic styles I admire everyday. Instead of passing this on to other bloggers (because seriously, it would be sent to our entire blogroll and beyond) I thought we would do something different. You open up to us everyday through your kind comments, and it'd be interesting to open up the discussion to learn more about you. If you wish, leave a comment with a random fact about yourself! Good job on the awards! Hey I'm loving your shoes! I'm obsessed with turquoise at the moment, the colour and the stone (however fake). i love the shoes with the dress here. the subtle pattern mixing is lovely! random fact? i am obsessively early to everything! gosh, i love the print on this dress!! too cute. it's springish but still very winter appropriate. and i didn't expect the shoe pairing but i like it. Love the open-toed shoe with tights! Cute look! You look so pretty!! I totally know what you mean in regards to the indoor photos...I have been doing mine indoors the past couple of days and the lighting is just terrible! You look gorgeous, btw. Oh, and before I forget, here's my random fact: I'm late to everything. Haha. hey i like your style and your blog! You are adorable! So glad I found your blog.